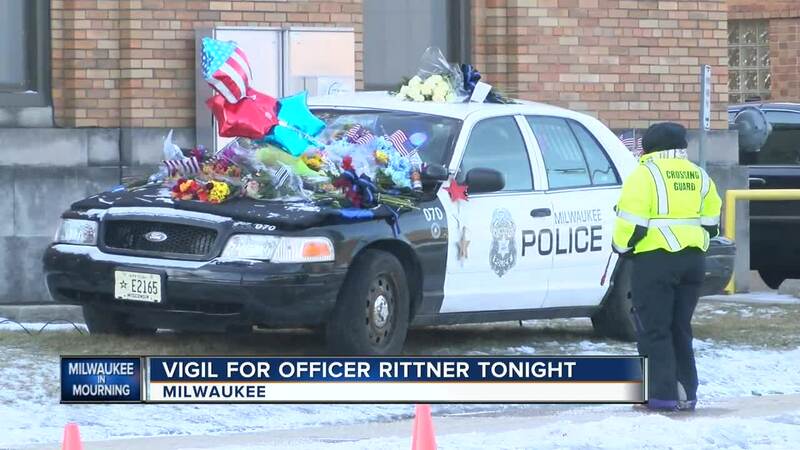 A vigil will be held Friday night for fallen MPD Officer Matthew Rittner. MILWAUKEE — The community will come together Friday night to honor a fallen officer killed in the line of duty. Officer Matthew Rittner was killed Wednesday morning during an operation near 12th and Dakota. Just a few blocks away at Zablocki Elementary, the community will honor him at 6:30 Friday night with a vigil. "It's unbelievable," Alderman Tony Zielinski said. "We were fortunate for 22 years, didn't have any officers that were killed in the line of duty. Here we are, three times in eight months. Hopefully this is the last time we have to do this." Zielinski helped coordinate the vigil at Zablocki Elementary. It's the culmination of several days of support. A growing memorial near 47th and Vliet continues to have passersby, even in frigid temperatures. "I wish the public would understand what these men go through every day," Jack Butcher of Hartford said. Butcher and his wife Claudia just moved back to Wisconsin. Butcher was a firefighter for Saukville. Claudia's father was a police officer in Sheboygan. Now their son is a lieutenant for Milwaukee Fire. Their entire lives have been defined by public service. Seeing the outpouring of public support was touching to them. "It melts your heart," Butcher said. "It makes you think there's still some good out here." Rittner spent pretty much half of his life serving the community. Friday night will be the opportunity the community can show its support of his service. "This is something kids look up to," Zielinski said. "Something you want to aspire to. It's a shame we had such a fine human being that was lost to our community. We have to pay our respects. I see the whole community is in support of this officer and paying their respects. I'm glad to see the community coming together." The vigil starts at 6:30 p.m. at Zablocki Public School at 1016 W. Oklahoma Ave. The vigil will be held indoors.